Okay, what's the last non-Euro trip or non-miscellaneous thing that I wrote about? I think I ended with July adventures, so let's revisit August and see what happened then. Technically the film festival was at the end of July, but who's counting? Kirsten and I found the dead witch and the yellow brick road. And then we made it into the Emerald City! It had popcorn, snacks, movies, and a wizard. There was an extra Dorothy hanging out. Awesome braids. All the film submissions are on this Youtube page. The Most Interesting Mormon ones are always pretty good. I think Urban Climber was the winner. They're all under 4 minutes, so go check a couple out! Disclaimer - I didn't think this year's films were as good as last year's films. After films, there was food - Bossa Nova, of course. This chicken was wrapped in bacon in a gorgozola sauce with some garlic bread. New favorite dish! And that's a lot of food for $10. I went to church at our funky building. Darryl came to LA for a work project. We had dinner and I took him to Cafe 50s for a shake. He couldn't believe how good it was. (Get the the Sunshine Shake, you will love it). I dressed up for Team USA. The beach at Huntington because this gal was in town. Oil rigs abound in HB. Do the neighbords get a cut? Despite the gorgeous views and knowing that I couldn't have been at work since I had a broken computer, I was still pretty stressed out. August challenge - drink more water. Two of these bottles a day. 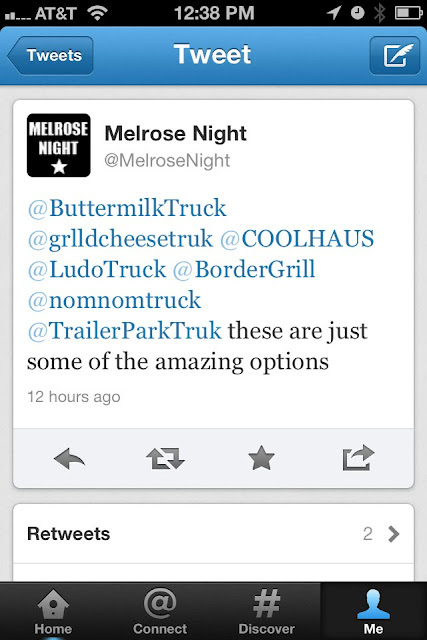 I should've gone to Melrose night, but I didn't. Next week . Look at all those food truck options! Some of my favorites - right there. I think this is from a neighborhood run that I did?